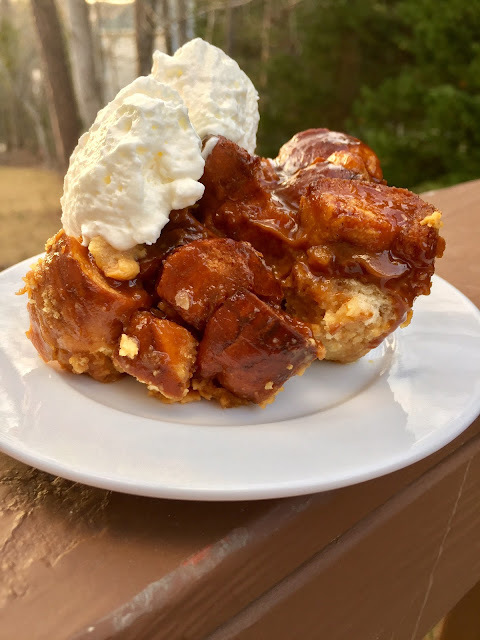 Once upon a time, when I was a young ambitious woman living in the bustling city of Chicago, I ate some salted caramel pretzel bread pudding. It was from a Charlie Trotter restaurant that was more of a deli where you could buy stuff to-go... I cannot remember the name. Please help. I think it was in Lincoln park. I digress... I remember shortly after trying the bread pudding, the restaurant closed down, and citizens of Chicago wept for days. I'm sure it wasn't because of the bread pudding, because that sh*t was amaaazing. It still haunts me to this day how delicious it was. I recreated the dessert in my cozy kitchen in Raleigh. I cubed up pretzel bread and toasted it up nicely in the oven to get it a little crisp. Then I soaked the bread in a mixture of evaporated milk, eggs, sugar, vanilla, and homemade salted caramel sauce. I used Bobby Flay's salted caramel sauce recipe and it worked beautifully. The mixture is baked, then topped with more caramel sauce, whipped cream and sea salt. This is soo good.... so rich, so addicting. The baking dish I used was larger than an 8x8-inch dish, but smaller than a 13x9. Any medium sized-baking dish should work. Also, I was wrong; it was chocolate covered pretzel bread pudding and it was from Trotter's To-Go. It wasn't salted caramel at all! Oh well, I put my own spin on the dessert. Heat oven to 350 degrees F. Place bread on a sheet pan and toast 10 minutes. Remove from oven and cool. In a large mixing bowl, whisk together evaporated milk, eggs, granulated sugar and vanilla until well combined. 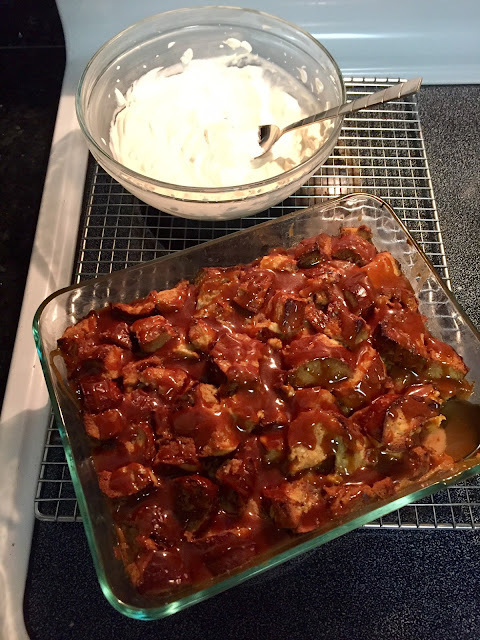 Stir in bread cubes and most of the caramel sauce (reserve 1/4 cup) and soak for 20 minutes. Butter a medium sized baking dish; add bread pudding mixture. Bake 45-50 minutes or until set and golden brown. Remove dish from oven and cool on a wire rack. Drizzle with remaining caramel sauce. Sprinkle with sea salt. Allow to cool at least 30 minutes before serving. Serve with whipped cream. 9 comments on "Salted Caramel Pretzel Bread Pudding"
as usual a very yummy looking recipe!!! 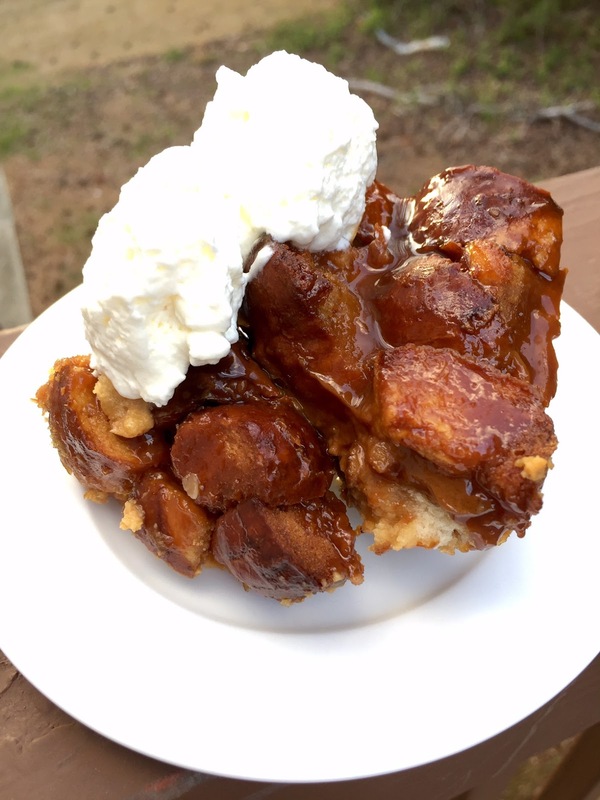 I have never made bread pudding - this looks pretty amazing. 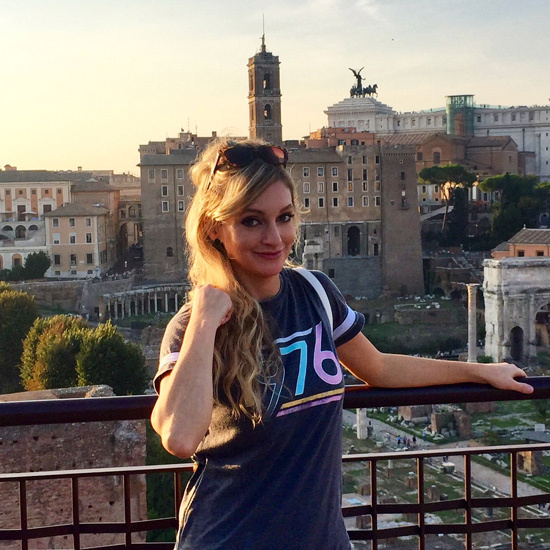 Hope you're doing well Emily - I need to check your blog for updates more often than I do! I remember when you had that bread pudding from Totters To Go, and I was so sad it closed because I couldn't go get any! But this looks equally as delicious, I just need some motivation to bake this summer! I was sad when it closed, too! Yes, you need to get into the kitchen! I know how you feel, though. I've mostly been cooking, not baking.